It seems like you can’t swing a pallet on Pinterest these days without hitting a dozen “50 Jobs That You Can Do At Home” posts. There are so many articles I see about how to become a WAHM (start a blog, direct marketing, etc. 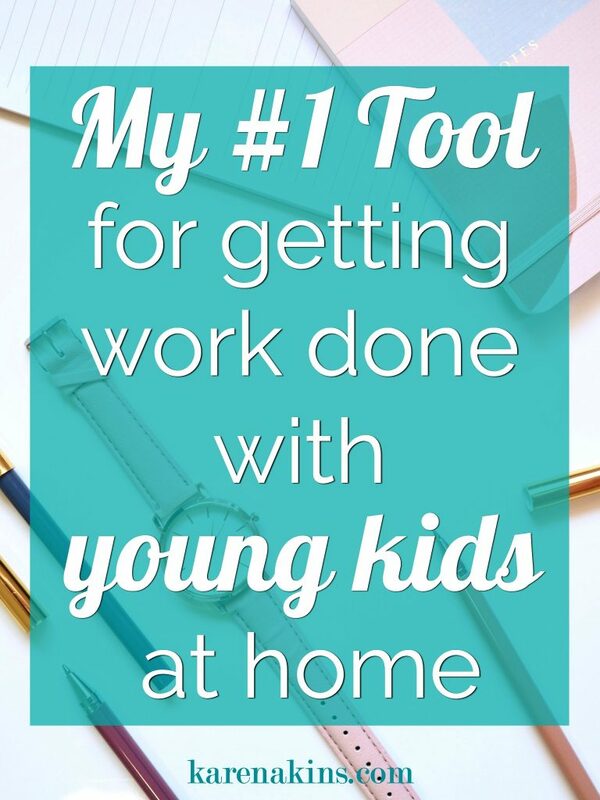 ), but then I rarely see any about how to actually get work done when you’re home with your kids. Don’t get me wrong. I love being able to stay home with my kids and also earn a living. I completely understand why people want to be able to do it. But it’s really, really hard to get work done while I’m home with my kids. There. I said it. I’m a writer. And as a creative, at any given time, swirling through my head, I have umpteen ideas of how to make a living writing. Unfortunately, translating those ideas into marketable products can be quite challenging. From writing, editing, publishing, marketing…it requires a significant amount of productivity. When I first started writing, I had one child. He was an amazing sleeper. We’re talking Olympic-level champion napper. Two and a half to three hours every day, easily. He’d go to bed at seven and sleep twelve hours OR MORE. And to this day, you could drive a freight train through his room at night, and he wouldn’t make a peep. I look back on that time and marvel at how productive I was. That, and naive. Then came book number two, Twist, right around the same time child number two was born. And this kid? Hoo boy. He came out sleep-averse. I was lucky if I got an hour-long nap out of him, and by that point my firstborn wasn’t napping, so I didn’t have any time where they were both asleep except the nighttime. But Kiddo 2 fought bedtime and had a difficult time sleeping through the night for the first couple years. I went from feeling like I had this work-at-home thing down to feeling like a complete productivity failure. Which, I’m not. I’m just a mom. I’ve had to readjust my priorities, my vision, and my schedule, but I love that I’m able to have a creative career and also be home with my kids. A lot of times it involves writing in the “cracks.” Waiting in carline, sitting in their gymnastics practice, squeezing in an unexpected fifteen minutes here and there. And any time I find something that makes my life easier and my work time more productive and flexible, I jump on it. Let me start by saying that everyone defines “tool” a different way. I have LOTS of productivity hacks, but I’m talking about an actual tool here. Every time I post about it on Instagram, I get a bunch of questions about it. (And I love posting it on IG because it’s just so dang cute.) Then, I need to answer all the questions people have. Where did I buy it? How much is it? Does it really work well? Hence, I decided to write this post. Every WAHM who sees it immediately realizes its potential to Get. Stuff. Done. It’s the Logitech K380 keyboard, and it works with any device that has bluetooth. What that means is that I’m able to write on my phone. Anywhere. Anytime. I take it EVERYWHERE with me, and it’s light enough that it easily fits in my purse. It’s perfect for writing in carline. Or at Chick-fil-A. Or the park. Or the pool. I used to bring my laptop in the car, but (a) I was worried about it getting stolen, and (b) I had to be a flippin’ Cirque du Soleil performer to use it during carline, contorting myself across the center console or under the steering wheel. I’ve been using this keyboard for months. I’ve written thousands of words on it, and I haven’t had to change the batteries once. It’s also super easy to switch back and forth from phone mode to writing mode. The next question I usually get is, “What app do you use to write in?” I typically draft in GoogleDocs, but I know that there are tons of word processing apps out there. (Word has one that’s highly rated.) I just like how easy it is to switch from device to device with GoogleDocs. And it does auto-backup, so I don’t need to worry about losing any of my work. Plus, it’s free. But seriously. I love this keyboard. Best $30 I’ve spent. 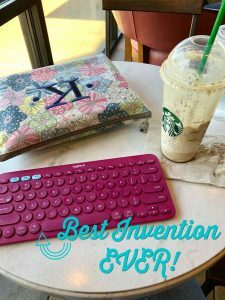 I researched all the portable keyboards I could find, and this one was the best fit for me and has great reviews for the best price. Some were bulkier, and I really wanted one that I could fit in my bag without being heavy. You can program this one to switch between three different devices at the push of a button, so you can pair it to a tablet or even a TV as well. The device just has to have bluetooth capability. Some reviewers even use it for their main keyboard. It would work fine for that, I guess. I just usually prefer writing on my laptop when I’m at home. Although, at night, I don’t like to leave my laptop unplugged, so if I’m going to write in bed, I’ll use my phone and this keyboard. I’m curious. What’s the one productivity tool you can’t do without? pssst. This post contains affiliate links to items that I love and use myself.